Odyne’s system utilizes a high-voltage, maintenance-free 14.2 kWh or 28.4 kWh lithium-ion battery pack designed for rugged work trucks. 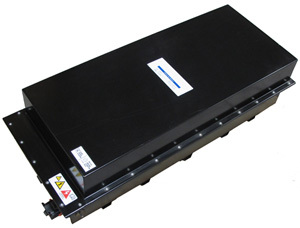 The battery pack is sized and located to suit the hybrid truck application. The Odyne hybrid system is dynamically controlled based on battery performance at any thermal condition to maintain optimal battery condition and life. Each plug-in hybrid truck battery pack weighs approximately 350 pounds (158 kg) and contributes to a lower total hybrid truck system weight when compared to other hybrid truck systems using less advanced battery technology. Each pack is mounted in a location to suit the hybrid truck application and doesn’t compromise ground clearance. Johnson Controls provides the lithium-ion batteries incorporated into Odyne Systems products. Each Odyne System battery pack has a 10-year design life.